Exploring Lynn Canyon Park--and crossing the free Lynn Canyon Suspension Bridge--is one of the best free things to do in Vancouver, BC. Located just 15 minutes' drive north of downtown Vancouver, Lynn Canyon Park is a gorgeous park beloved by visitors and locals alike, with lots of free activities for all ages, including the suspension bridge, waterfalls, mini-hikes, and a swimming hole for summer. The most famous feature of Lynn Canyon Park is the Lynn Canyon Suspension Bridge, the free alternative to Vancouver's famous (and pricey) Capilano Suspension Bridge. Unquestionably, the Capilano Suspension Bridge is by far the more dramatic of the two, and admission to the Capilano Suspension Bridge Park does include several other adventure attractions. But the Lynn Canyon Suspension Bridge has a wonderful charm of its own, and, stretched 50 feet above the churning waters, waterfalls, and pools of Lynn Canyon, it's just as beautiful. Plus there are fewer visitors at Lynn Canyon, making it a more peaceful and intimate experience. Like Capilano Suspension Bridge, it's pet-friendly so you can bring your four-legged furry friend if you want to do a hike with your dog. It's the peace and intimacy of Lynn Canyon Park that makes it such a hit with locals. From the park's visitor centre--the area closest to the parking lots, where the Lynn Canyon Suspension Bridge, Ecology Centre, and Lynn Canyon Cafe are located--visitors can use maps provided at the Ecology Centre to explore the park's many hiking trails, which take you through the forest to scenic vistas, including the popular Twin Falls (where a wooden bridge stretches over the river, in view of two gorgeous waterfalls) and the 30 Foot Pool swimming hole, an ideal spot to keep cool in the hot summer months. If possible, head here on a weekday for an even quieter experience of the stunning scenery and trails. Summer weekends tend to get a little busy, even as it remains more of a hidden gem than bigger tourist attractions in the area. The visiting center of Lynn Canyon Park is located at 3663 Park Road in North Vancouver. You can drive and park within a short walking distance of the visiting center hub (the Ecology Centre/Lynn Canyon Suspension Bridge), or you can easily take public transit. Keep an eye out for the right bus stop as the park is near a residential area so it can be confusing for first-time visitors, but it's worth seeking out. You can also hike to Lynn Canyon Park as it's part of the extensive Baden Powell hiking trail, which stretches from Horseshoe Bay in the west to Deep Cove. The section through Lynn Canyon Park takes approximately an hour to an hour and a half to complete. Trail maps can be picked up from the Ecology Centre near the suspension bridge. 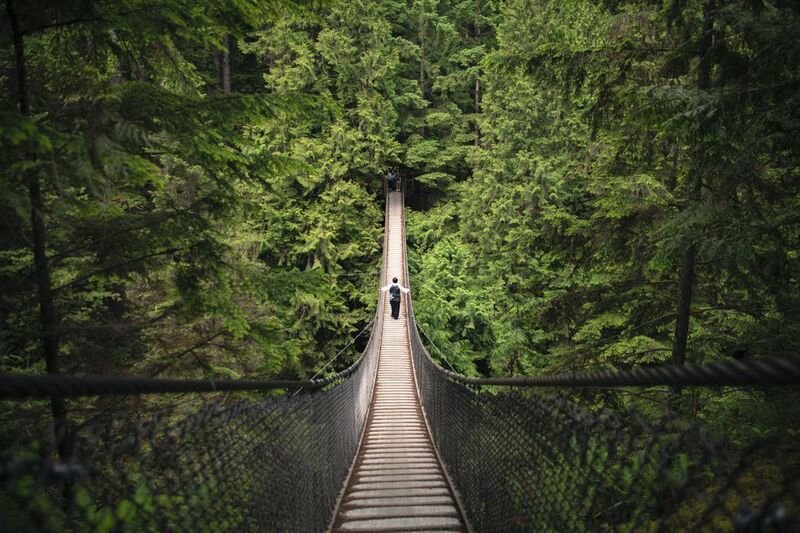 Because they are both in North Vancouver--and only about a 20-minute drive apart--you could compare suspension bridges with back-to-back trips to both Lynn Canyon and the famous Capilano Suspension​ Bridge; just be prepared to pay for admission to the latter! Grouse Mountain is also fairly close by and just a five-minute drive from Capilano. Sadly, Lynn Canyon Park is not accessible to people with mobility issues. If you have trouble walking unaided, this isn't the Vancouver park for you. Strollers are also not usable on most of the hiking trails (or on the Lynn Canyon Suspension Bridge); you will need a front or back baby carrier to navigate the terrain with a baby too young to walk. See the Lynn Canyon Park website for opening hours information.